Crystal Valley Cemetery is located on the south side of Manitou Springs at 502 Plainview Place. To reach the cemetery, take Manitou Avenue west and turn left onto Crystal Hills Boulevard, right at Poplar Place, and right at Plainview Place. The cemetery is located at the end of the street. According to GPS-derived geolocation (accurate to within 10 meters), the cemetery's coordinates are 38°51'08.5"N and 104°54'15.1"W. The city of Manitou Springs maintains both the records and grounds of the cemetery. The Sexton's Office is located at 101 Banks Place, Manitou Springs, CO 80829; telephone: (719) 685-4156. The summer weekday hours of the cemetery are 7:30 a.m. to 7:30 p.m. Winter weekday hours are 8 a.m. to 5 p.m. On weekends, the cemetery is unlocked by the Manitou Springs Police Department. If the gate is not unlocked on the weekend, call the police at 685-5407 for access. According to The Springs of Manitou by Bettie Marie Daniels and Virginia McConnell, the original Manitou Springs Cemetery was located on Pawnee Avenue, across the street from the present-day public library. However, by the early 1880s, the City of Manitou was becoming a boom town for health-seekers and tourists, which prompted the owner of the property, Dr. Isaac Davis, to replat the area. 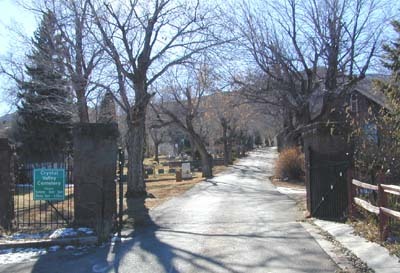 As a result, the cemetery was moved to Crystal Valley following an arrangement with the City of Manitou Springs to exchange the original graveyard site for the present property. The removal of bodies from the original location began in 1885. That year, the first monument erected at Crystal Valley was commissioned by Dr. Davis in memory of his mother, Hannah. The 11-foot sandstone shaft surrounded by a four-foot wall is still present today. Although fire destroyed many of the early records, it is evident that by the early 1890s private ownership of the cemetery had ended and the city had taken claim of the land and management of burials. Several prominent individuals are buried at Crystal Valley Cemetery. General Charles Adams negotiated for the release of captives during the infamous Meeker Massacre in Colorado. His headstone is inscribed "Rescuer of the Meeker women after the Indian massacre at the Colo.White River Agency - Sept. 29, 1879." He also served as U.S. Ambassador to Bolivia and upon retiring to Manitou Springs, General Adams was instrumental in organizing the Manitou Springs Mineral Water Bottling Company.